Today’s Star Spangled Salute honors Kansas Honor Flight. Kansas Honor Flight is made up entirely of volunteers who work to honor Kansas veterans of World War II, The Korean War and the Vietnam War by providing them with an all-expense paid, 3-day journey of honor and remembrance to the memorials in Washington, D.C. 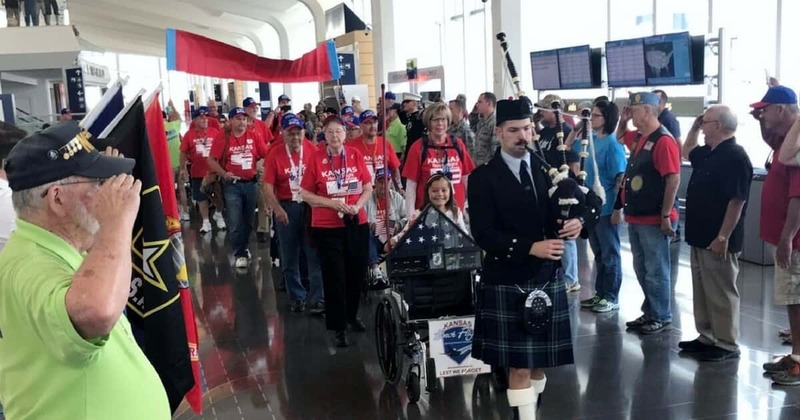 This Wednesday, Kansas Honor flight #68 leaves Dwight D. Eisenhower airport and will return for first “Heroes Welcome” of 2019 on Friday at 11:55a. If you would like to honor these heroes, welcome them home or volunteer, you can contact Kansas Honor Flight. To all the volunteers and veterans, thank you for you dedication and service.